A beer brewed with an anti-racism message could be discontinued amid a trademark dispute. 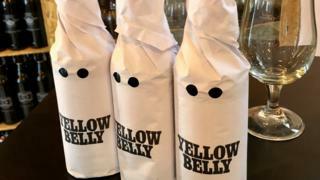 The name and design of Yellow Belly, an 11% stout brewed by Buxton Brewery and Omnipollo from Sweden, was intended to lampoon the Ku Klux Klan. However, Batemans Brewery said the name was similar to its own beer, which refers to its native Lincolnshire. The European Union Intellectual Property Office (EUIPO) is reviewing the case. Buxton and Omnipollo first released Yellow Belly - a peanut butter and biscuit-flavoured imperial stout - in 2014 after being brought together in The Rainbow Project, a collaborative event randomly pairing seven British breweries with counterparts from around the world, with each duo assigned one of the colours of the rainbow. The brewery explained they drew yellow. It said the "prime meaning" of the colour was cowardice so chose to design the bottle in a way that would highlight what it saw as the cowardice of racist elements of the far right. The beer became popular with craft beer aficionados but as a result of the trademark opposition, next year's edition looks set to be the last. Batemans Brewery said it first began brewing a Yella Belly beer 20 years ago as a vanilla pale, with its current iteration, Yella Belly Gold, a 3.9% amber ale. People born and bred in Lincolnshire are known colloquially as "yellowbellies", although the origins of the phrase are widely disputed, with the colour of mail coaches, the attire of the Royal North Lincolnshire Militia and a range of animals all cited as possible causes. Geoff Quinn, owner of Buxton Brewery, said it was "a shame" to discontinue the beer, but said it wanted to avoid "legal wrangles which wouldn't really benefit anyone". "We don't see how we could get accused of passing off our beer as theirs or vice-versa," he said. Henok Fentie, head brewer for Omnipollo, said it was "a bummer" to discontinue Yellow Belly, but said he would "rather spend money on putting more hops in our beer" than on legal issues. Stuart Bateman, managing director of Batemans, said he first learned of Yellow Belly when he was called by Omnipollo two months ago alerting them to the issue, and had not been contacted since a "friendly" initial discussion. He said he was "surprised" by the online backlash from some fans of the beer, but said breweries ought to check other registered names before releasing beers. "My logic on it is if various people that are going on social media and are adamant about the importance of the name Yellow Belly, then they appreciate there's an importance in branding," he said. But he said he hoped to be able to reach a solution with the other firms. A spokesman for the EUIPO said it could not comment on individual cases, and a final decision has not yet been reached in this case. Chartered trademark attorney Chris McLeod said the huge growth in the number of breweries - from about 700 across the UK in 2008 to more than 2,000 as of last year - meant trademark issues around new beers are likely to become "relatively common" in the "increasingly crowded" sector. While dealing with the EUIPO "is about as inoffensive or as unaggressive as you can be in objecting to a third party", he said breweries ought to take care when naming their new products.